Design patterns are still a thing — a big thing. More and more, designers can rely on robust and comprehensive interaction pattern libraries for solving common design use cases. Now that the basics are covered, where do we want to focus our efforts? You don’t need to reinvent the wheel when designing a door handle. Innovation just for innovation’s sake, like trying to create a completely disruptive navigation system for your website or app, can bring usability problems in the long term. It all comes down to: what exactly is the user need you’re trying to solve by introducing a new interaction pattern? Luckily, interaction design pattern libraries and guidelines are helping keep designers honest and focused on what really matters for the user: getting things done in an easy and familiar way. Meeting basic usability standards is crucial for any successful product these days — although someone in the room will always feel entitled to raise their hand and argue Snapchat is not the most “intuitive” experience ever, yet is still successful. In an era where meeting basic usability requirements is a given, and competing products are reaching feature parity fairly quickly, what really differentiates digital products is how relevant and delightful the experience can be. The word “usability” itself is losing a bit of importance. It requires too little from us. Why does one choose to use Gmail over Yahoo, Medium over Blogger — if the features are 99% the same? It’s definitely not about disrupting usability standards. It’s about that additional layer of sophistication that can only be achieved when you put enough time and brainpower into the tiniest details, the most subtle animations, the most elegant transitions – not just for the sake of creating whimsical dribbble shots. 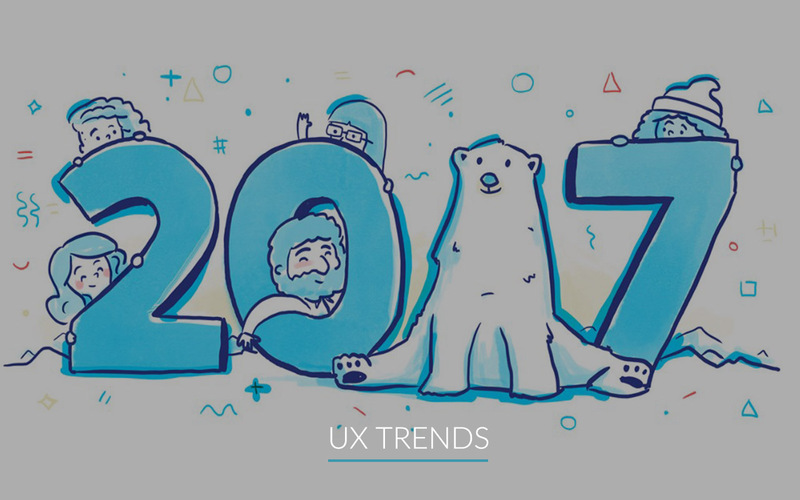 In 2017 designers should not be afraid of starting from design patterns to cover the basics, and then focusing the bulk of their time on the details that will make experiences feel more relevant, delightful — and therefore more memorable. Words are funny. They carry a lot of meaning, and it’s interesting to look at how that meaning evolves over time. Do you still need to sell your design as “mobile-friendly”? Do you still describe experiences as being “intuitive”? What does that even mean? Back in 2011 everyone was talking about Responsive Design. The possibility of designing and building one single web experience that was able to fluidly adapt to multiple screen sizes was eye-opening at the time. Interestingly enough, fluid layouts are a native functionality of HTML — but over the years web experiences had been built with too much focus on large, desktop screen resolutions. We went back to the basics and proudly coined it “Responsive Design”. It was the topic everyone was writing, reading, and tweeting about that year. Fast forward a couple years and designing websites that are responsive is the new norm. Now we only call out the exceptions, and in many teams, projects and companies, responsiveness is an assumption that everyone makes right from the get-go. We don’t sell an experience as being “intuitive” — we prove it through user testing and positive feedback from customers. We spend less and less time arguing whether a piece of content should live “above the fold” or “below the fold”; the plethora of screen sizes we see today are quickly making concepts like “the fold” outdated. We don’t say something is “just two clicks away”; the burden of extra clicking was a bigger problem when interactions were limited to cursor and hyperlinks on a low speed connection. We don’t sell our process as being “human-centered”; it’s an assumption that any capable and successful company these days will bring users to the design process at some level and at some point in the project. 2016 was the year Google decided to remove the label “mobile friendly” from its search results. According to Google’s search team, “85% of all pages in the mobile search results now meet the appropriate criteria and show the mobile-friendly label”. Since the vast majority of mobile results are mobile friendly, there is no need to label them as such. All websites are now (or should be) “mobile-friendly”, and as a designer you don’t need to keep stressing that over and over when you present your mockups to someone new. Quickly, our vocabulary shifts and evolves to let us focus on new design challenges. What words are you crossing out of your daily lexicon in 2017? What new words will you be adding? “Chatbot” is one of the hottest terms in our industry right now, and we are pretty confident you are going to be building one quite soon — if you haven’t already. But what does the future of Conversational Interfaces look like? If you’re reading this article, there’s very little chance you haven’t heard about Conversational Interfaces in 2016. At uxdesign.cc, we’ve written about the technical and social challenges of designing conversations, helped designers who wanted to get started in that space, talked about prototyping bot experiences, and even curated some of the best chatbot experienceswe’ve seen this year. Essentially, a Conversational Interface is any user interface that mimics chatting with a real human. But stepping back for a moment: isn’t every interface a conversation between the user and the machine? Think of the most common apps you use everyday. Like hailing a cab. First, you tell Uber that you need a ride. Then, it asks you where you are, and once it has found a driver, it tells you the time estimate. When the ride is over, it asks you how it went. And you tell it your opinion by clicking on the stars and rating the ride. “Chatbot” is the next big buzzword in design — and our industry is seeing a lot of interest from companies in exploring that space. Automated, conversational experiences allow brands to inspire, communicate with and serve their customers right where they are, in a much more scalable way. Apps like WeChat have become the central destination for a plethora of services in China. Over half a billion people use WeChat, and it touches everything — from consumers communicating with friends, to sharing their daily moments, to buying everything from food to paying credit card bills. It’s IM, ecommerce, banking, dating, gaming and marketing rolled into one platform, where you can shop, order food, book doctor appointments, find parking spots nearby, book hotels, hire maid/nanny/babysitter, hail a taxi, and so on. All through conversations — and mini-apps that run within those conversations. Messenger, Kik, Slack, and many other messaging platforms have been working hard in 2016 to expand their capabilities and allow for similar experiences through conversations. Not to mention voice interfaces — Siri, Alexa, Google Home, and so many others — a natural next step for chatbots, and a business opportunity that will inevitably affect the way you, as a designer, think about products and services in the near future. The interactions of the future are not made of buttons. Create is a world-class digital design company with roots in Nairobi. A close knit community of Creatives and developers that work on projects we consider to directly impact the society positively. © Copyright Create. All Rights Reserved.